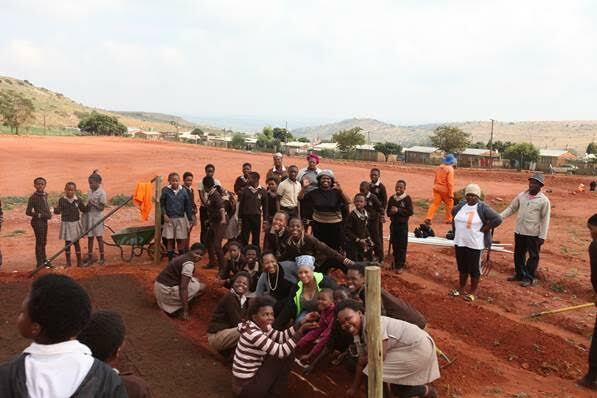 At the start of the second school term, Silverstar Casino employees had a morning of green fingers with the pupils at Munsieville Primary School. With assistance from Reel Gardening and its founder, Claire Reid, the group successfully installed an organic vegetable garden at the school to aid in the provision of food for their students. The township of Munsieville is situated between Magaliesburg and Krugersdorp, and the primary school hosts many learners from disadvantaged backgrounds. Although Munsieville Primary does receive food subsidies from the government, this is often not enough. For some learners, the meal they receive from the school, is their only meal for the day. A product called “Garden in a Box” was used for the vegetable garden at Munsieville Primary. It includes seeds strips produced from patented, biodegradable paper, which holds seeds at a correct distance apart. The paper anchors the seeds at the correct depth in the soil for optimum germination. So far, they have planted spinach, onions, beetroot, carrots and lettuce. The school plans to expand the garden at a later time, with more vegetable options such as sweetcorn, tomatoes, green beans and green peppers. In an effort to ensure the longevity of the project, the school will make sure that this is a sustainable development for their learners. They have a vision to integrate the maintenance of the vegetable garden into the education system, this includes having outdoor lessons for some subjects and involvement the project itself. The garden will also be looked after by a group of volunteers who are part of the school’s Community Work Programme, made up of parents of the learners. “Munsieville Primary is one of the schools that we have been committed to, and have involved in the various educational and sports programmes offered by the property. Silverstar felt it was important to address their urgent need and provide additional support for their feeding programme. Learners perform best with a full belly and we hope that the Veggie Garden will positively contribute towards the sustenance and nutrition that they require in a sustainable way,” says Shane Collinson, Director of Operations and Complex General Manager at Silverstar Casino.